Marshall lives in a world where most people have super powers, but not everyone has really great ones. For example, he can shoot lasers from his eyes, but he's cross eyed. He can also fly, but every time he does, he suffers from motion sickness. He'll never get chosen to be on the Superteam, like Trevor, and tends to hang out with friends who are "defective" like him; Tim, whose allergies to peanuts endow him with Hulk like qualities, but also restrict his ability to breathe, Crash, who has super speed but can't stop, and Lewis, who, well, is Lewis. When Marshall comes across former super hero Owl Man, he and his friends get sucked into a secret project that pits him not only against another group of defectives, but ultimately against members of the Superteam. Will Marshall, the Owl Man, and the others be able to save the day and prove that even though they aren't perfect, they're super? Strengths: Superheroes are really popular with my students, as are graphic or notebook novels, and this combines all of those things. Like Libenson's Invisible Emmie and Schade and Buller's Scarlett, this is a mix of cartoon style panels and text. The plot moves along with clear rapidity that will keep young readers engaged, and has plenty of puke jokes. The variety of characters, as well as their quirky super powers, will have readers laughing and thinking of their own versions based on their friends. The artwork is clear and hits the right cartoon note for middle grade; not too simplistic, with an older teen feel to some of the dark tones of the illustrations. Weaknesses: The print is very small, which could be a deal breaker. 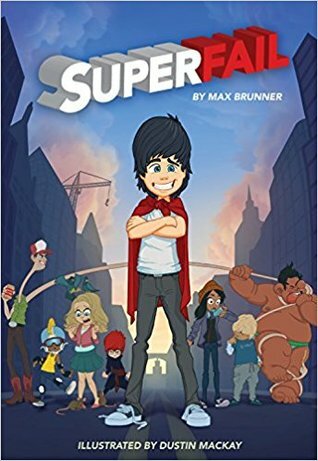 My reluctant readers are the ones who prefer super hero stories, especially ones with bodily humor, but they are also very quick to turn a book away if the print is too small. My more sophisticated graphic novel readers, who like Nimona and are okay with smaller print, will not appreciate the barf jokes. What I really think: Before I put this on the shelf, I will glue the spine a bit more firmly. Graphic novels, because of the nature of the color pages and of the frequent use, wear poorly. I don't quite know how this one will go over with my students, but am interested to see.